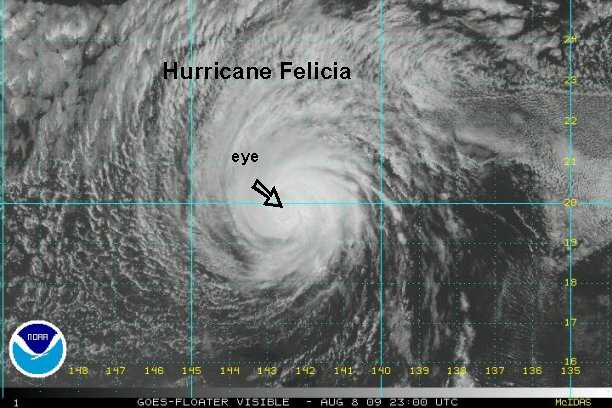 Hurricane Felicia reversed a trend seen last night and early today. After looking battered, the eyewall has once again expanded with cloud tops cooling. Felicia may make another shot at becoming a cat 3 again - 111-130 mph. 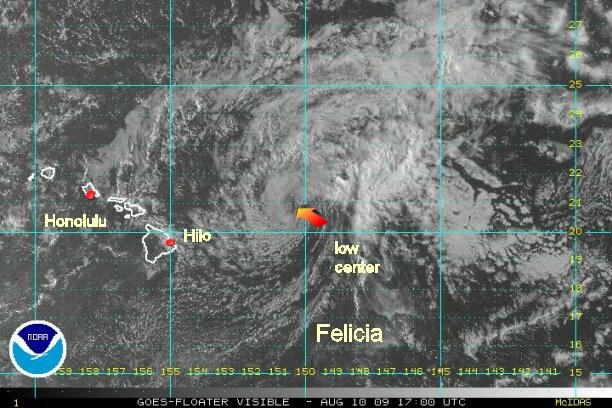 As of 8:30 pm edt / 5:30 pm pdt Felicia was centered near 18.7° N / 137.6° W or about 1135 miles east of the Big Island of Hawaii. We estimate that Hurricane Felicia is now at 105 mph. Hurricane Felicia is moving west northwest at about 14 mph. It's possible Felicia could reach the Big Island as a weak tropical storm or tropical depression early next week. Sea surface temperatures are warmer just east of the Big Island which may help sustain Felicia. After last nights small burst of strengthening, Hurricane Felicia has weakened slightly. More recently, over the past hour or two, cloud top have cooled again. This indicates that the weakening has stopped for now. Also, is appears that during the past few hours the hurricane has made the anticipated westward turn. As of 7:30 am edt / 4:30 am pdt / 1:30 am hst Felicia was centered near 19.2° N / 139.9° W or about 990 miles east of Hilo, Hawaii. We estimate that Hurricane Felicia is now at 90 mph. Hurricane Felicia is moving west about 18 mph. It's possible Felicia could reach the Big Island as a weak tropical storm or tropical depression by late Monday. Warmer ocean water east of the Big Island will try to keep Felicia energized. An overriding factor will be the wind shear. An upper trough is over Hawaii which should tear deep convection away weakening it. Satellite imagery shows that Felicia is now only a minimal hurricane and may become a tropical storm by tonight. The eye appearance has deteriorated markedly today. NHC keeps Felicia a hurricane until late tomorrow morning (edt). 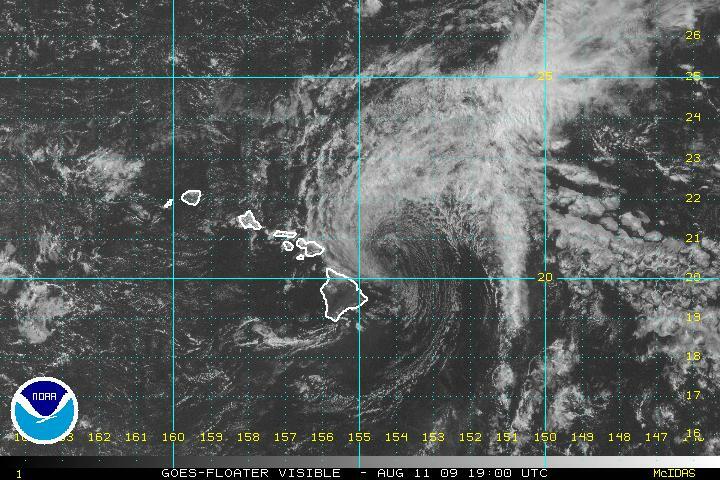 As of 3:00 pm edt / 12:00 pm pdt / 9:00 am hst Felicia was centered near 19.2° N / 141.4° W or about 890 miles east of Hilo, Hawaii. We estimate that Hurricane Felicia is now at 75 mph. Hurricane Felicia is moving west northwest about 15 mph. 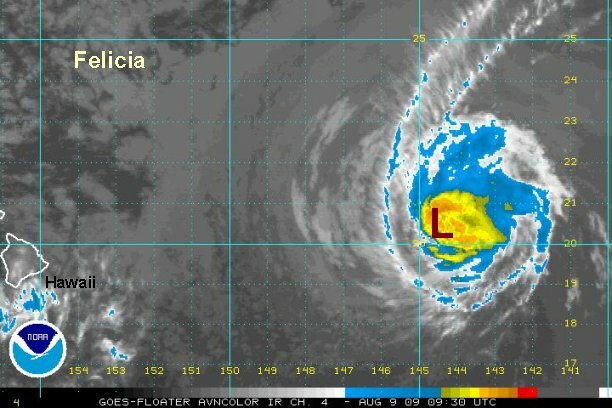 Latest satellite imagery shows that Felicia has continued more on a westerly course after moving west northwest for a short while. The overall structure has not changed much over the past several hours. As of 8:00 pm edt / 5:00 pm pdt / 2:00 pm hst Felicia was centered near 20.0° N / 142.7° W or about 805 miles east of Hilo, Hawaii. We estimate that Hurricane Felicia is now at 75 mph. Hurricane Felicia is moving west about 15 mph. 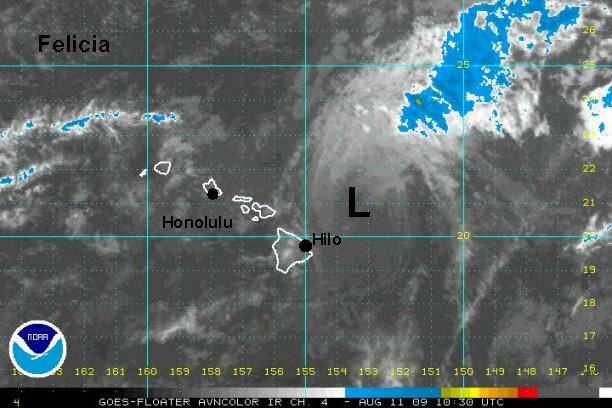 Tropical storm watches are posted for the Big Island of Hawaii and all of Maui county. As of 7:00 am edt / 4:00 am pdt / 1:00 am hst Felicia was centered near 20.3° N / 144.8° W or about 670 miles east of Hilo, Hawaii. We estimate that (Hurricane) Felicia is now at 70 mph. 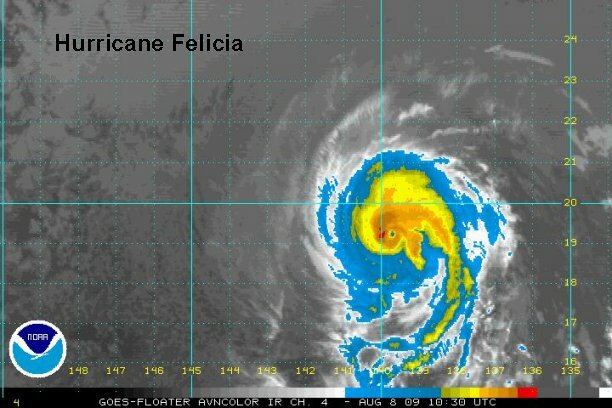 Felicia is moving west about 15 mph. 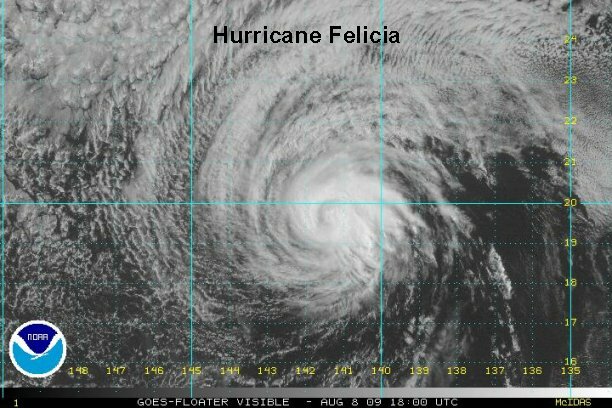 Satellite imagery shows that shearing is starting to take place and that Felicia is no longer a hurricane. We are in a quandary though. Recon and satellite estimates indicate that surface winds are now about 70 mph. As usual, flight level winds are stronger, so hurricane force winds are still found aloft. Basically, Felicia is a tropical storm - in our opinion at the surface (low levels) and still a hurricane aloft (higher levels). The reason that this is important is because there is very high terrain on many of the Hawaiian islands, especially the Big Island. Effects of wind will be greater up the slopes of the mountains. By the time Felicia reaches Hawaii it should be considerably weaker and this difference in winds aloft not as magnified. Water temperatures are warmer just east of the Islands, but wind shear is expected to increase. This should continue to weaken Felicia. Flash Flooding is also a concern, especially on the eastern mountain slopes. Now is the time to complete preparations for Felicia. CPHC downgraded to a tropical storm on their 11 am edt / 5am hst advisory. 70 mph. As of 2:00 pm edt / 11:00 am pdt / 8:00 am hst Felicia was centered near 20.9° N / 146.4° W or about 570 miles east of Hilo, Hawaii. We estimate that Felicia is now at 50 mph. This is probably a generous estimate. The official CPHC estimate was 70 mph last advisory. They will defiitely bring their winds down later today too. Felicia is moving just north of due west about 15 mph. Latest satellite imagery shows that upper air winds are tearing the circulation of Felicia apart. No deep convection remains on the western side of the circulation closest to Hawaii. The convection is collapsing and Felicia may be only a minimal tropical storm by later today. It's possible if all of the convection is stripped, is could become a tropical depression by tonight. This is excellent news for Hawaii. CPHC just updated to 55 mph on there last advisory. Still a little above our 50 mph estimate a few hours ago. 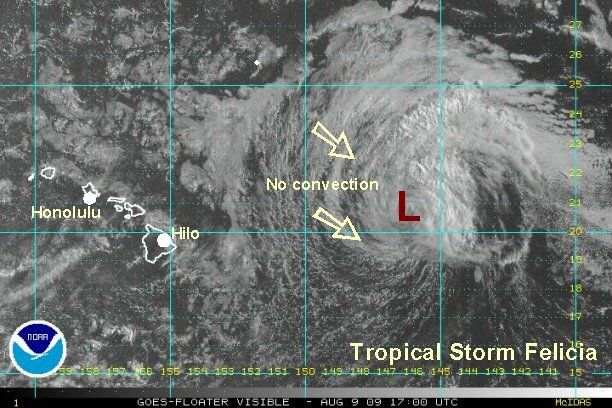 Convection continues to decrease for the exception of a small area northeast of the low center. It is likely that Felicia will become a tropical depression within six hours. The biggest impact to the Hawaiian Islands will likely be enhanced rainfall, especially on the windward slopes. As of 8:30 pm edt / 5:30 pm pdt / 2:30 pm hst Felicia was centered near 21.0° N / 148.0° W or about 470 miles east northeast of Hilo, Hawaii. We estimate that Felicia is now at 40 mph. This is based on the burst of convection northeast of the center of circulation. The low center inself probably does not have winds sustained at more than 30 mph. Felicia is moving just north of due west about 15 mph. Do not be concerned about "landfall times". There is little activity near the low center. The only weather noticable would be registered low pressure on your barometer and a wind shift where the low crosses land. Felicia continues to hold onto a small area of deep convection northeast of the center of circulation. For a few hours, shear lessened and the convection built close to the center. The shear has increased again and by our estimates, Felicia is holding on as a tropical storm by the slimmest of margins. As of 6:30 am edt / 3:30 am pdt / 12:30 am hst Felicia was centered near 20.9° N / 149.6° W or about 365 miles east northeast of Hilo, Hawaii. We estimate that Felicia is now at 40 mph...and that is a generous estimate. CPHC estimates 50 mph. Our earlier reasoning has not changed: This is based on the burst of convection northeast of the center of circulation. The low center itself probably does not have winds sustained at more than 30 mph. 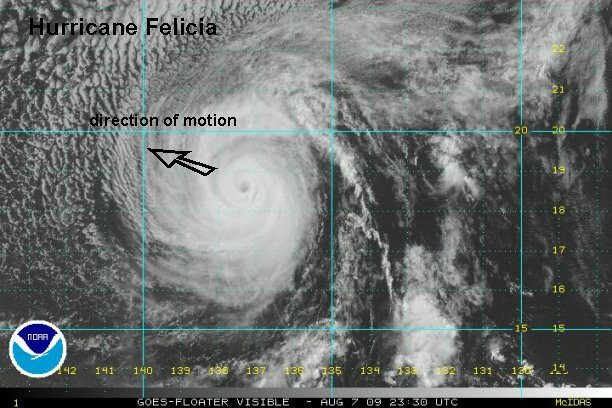 Felicia is moving west about 14 mph. It actually wobbled a little south of west for a few hours, but is moving west again. Visible satellite imagery shows that upper level wind shear has taken its toll. The only deep convection left is far removed from the circulation center to the northeast of the low. 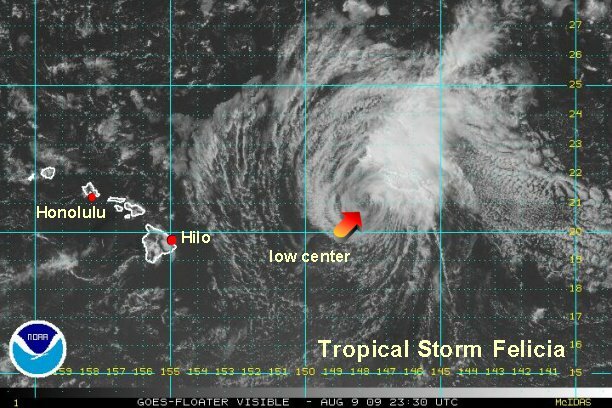 As of 2:00 pm edt / 11:00 am pdt / 8:00 am hst Felicia was centered near 20.9° N / 149.6° W or about 300 miles east northeast of Hilo, Hawaii. We estimate that Felicia is now at 35 mph and no longer a tropical storm. CPHC estimates 45 mph. Felicia is moving west about 10 mph. Don't worry about when the center crosses land. These will only be a wind shift as the low goes by. The only convection is far northeast of the cent. 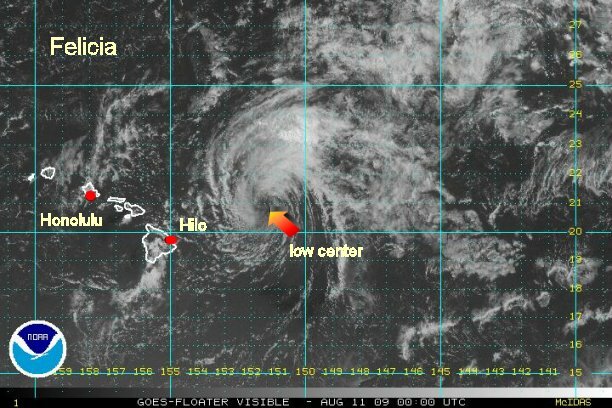 As of 9:00 pm edt / 6:00 pm pdt / 3:00 pm hst Felicia was centered near 21.0° N / 151.7° W or about 235 miles east northeast of Hilo, Hawaii. We estimate that Felicia is 35 mph and not a tropical storm. CPHC estimates 45 mph. Felicia is moving west about 12 mph. Felicia is nothing but a low level swirl. Again we are really surprised that this is still being classified as a tropical storm. The main threat will be enhancement to showers, especially on the windward slopes. 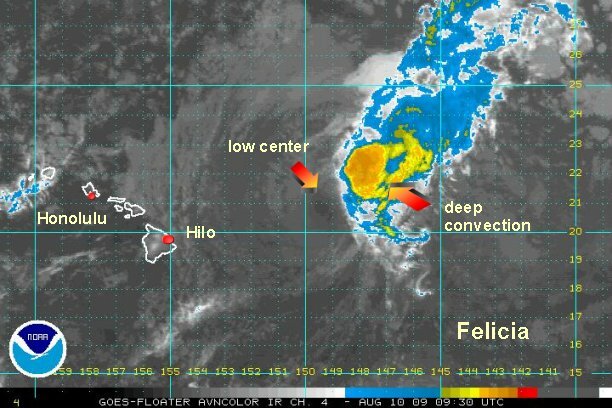 As of 7:30 am edt / 4:30 am pdt / 1:30 am hst Felicia was centered near 20.9° N / 153.2° W or about 150 miles northeast of Hilo, Hawaii. We estimate that Felicia is 30 mph sustained and not a tropical storm. Some gusts may be 35-40 mph. CPHC estimates 40 mph. Keep in mind that winds aloft are higher, so that winds may be a bit stronger on the higher slopes of Hawaii, once the circulation of Felicia crosses into the central Hawaiian Islands. CPHC finally has downgraded to tropical depression Felicia. This will be our last update on Felicia.